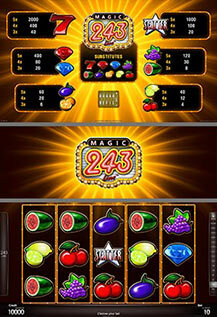 This fantastic fruit game offers more winning chances than ever before! Magic 243™ combines magical design and music with the innovative concepts ALLPAY® and Reel Refill™ for maximum fun on your reels. The Magic 243™ symbol substitutes for all symbols, except SCATTER. All prizes are for combinations from left to right, except Scatter. This game offers additional chances to win with the Reel Refill™ Feature. Symbols in winning combinations disappear and empty spaces are filled up with symbols following up.